Solar chargers are thankfully getting smaller and smaller, which is good for those of you that prefer to use renewable energy every chance you get. It’s also great for those that just would like to have a small solar charger in case of an emergency. This one is plenty small enough that it could even easily fit into your pocket. It’s ideal for all of your smaller gadgets to give you a charge when you’re in dire need of one. Something like this would not only be great to have around, but having a spare one to keep in your car just in case of emergencies would be great too. 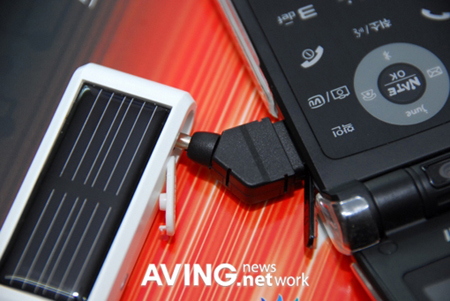 You can charge up cellphones, MP3 players and digital cameras. This small Sun Drive is actually only 64mm by 25.8mm. On a full charge it’ll give your phone up to 100 minutes of continuous talk time and up to 25 hours of standby time on a single charge. The solar panel isn’t out just yet and there’s no real price right now. When it does come out though, it looks like it’s at least initially going to only be hitting the South Korean market.